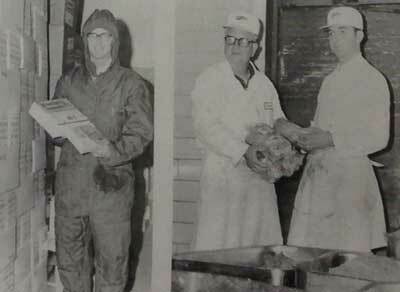 Foutch’s has always primarily been known as a a meat and food distributor. In the 1970s we started carrying Mountain Valley Spring Water and delivering it to customers. When we made the decision to close down the food distribution side of the business, we moved our focus to the water and coffee side of Foutch’s. We partnered up with Southern Coffee and Spring Water in Chattanooga, Tennessee and have been providing only quality water and coffee to our customers ever since. 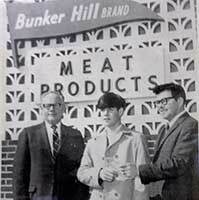 One of Foutch’s first meat stores in Cookeville was this market at 24 N. Cedar Ave. 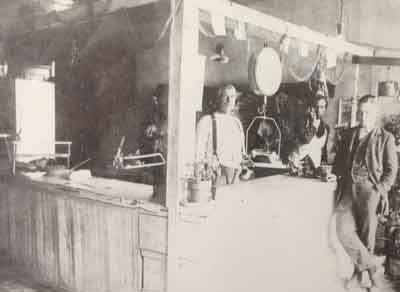 This first photograph is from 1914 and includes T.J. Foutch, left, his son, J.J., at right, and a store employee in the center back. Foutch’s Distributing was located on Bunker Hill Rd. (the area now located behind Kroger and called Foutch Dr.) for many decades. In 2000, Foutch’s discontinued it’s meat packing and food distribution services and focused on spring water and coffee sales and delivery. Foutch’s is currently located in Algood, TN. Three generations of the Foutch family join in the company in this photo. From left, J.J. Foutch, his grandson Martin, and son James. Today, Martin’s son Taylor works in the family business. To provide our customers with outstanding service and quality products while keeping our prices competitive. We strive to improve and make our customers happy so feel free to send us an email with any suggestions! In an age of possible terrorist attacks on public water systems, the only sure source of “clean and pure” water may become bottled at the source spring water. We deliver all over the Upper Cumberland. Cookeville daily, Crossville weekly, and many other places every 2 or 4 weeks. Please see our service area for more info. Our spring water has never been contaminated by toxic chemicals or waste products. It is “clean and pure” at the source. Since bottled water coolers are not driven by public water supply pressure, a bottled water cooler has very limited risk of flooding and causing a large amount of water leakage damage. Toxic and other chemicals found in public water systems and filters can give water an objectionable odor and taste. Our “clean and pure” at the source spring water is refreshing and enjoyable. It promotes health because you will drink more water if you enjoy its taste. A bottled spring water cooler can be placed anywhere there is one square foot of space with electricity.